In reinforced concrete, reinforcement contributes to limit cracks number and their width. We know if steel reinforcement is anchored at the end properly, a tension member like beam will not collapse prematurely even after entire span allow slip due to failure of bond; but wider cracks are formed. We know two types of steel are available based on surface deformation. When beams are reinforced with round and smooth bars, the cracks of greater width are observed under tension relative to member reinforced with deformed bars. Interestingly when beams are reinforced with deformed bar providing good resistance against slip, shows more number of cracks relative to that reinforced with plain bars. Thus when crack number is increased crack width becomes less; more precisely fine cracks are found which are almost invisible under naked eyes. This is achieved by used steel having proper surface deformations. Plain bars, stated above, are now almost replaced by deformed bars, due to importance in crack distribution and also limiting of the same.The spacing requirements and minimum projection from surface of bar are provided by ASTM specification (ASTM A615, A 996 and A706). Crack formation, definitely, make concrete section weak, but if they allow environmental agent to penetrate through them, section is severely damaged. The next factor is stress applied to reinforcement. fs is determined as per ACI code 10.6.4. Determination of crack width in reinforced concrete section will be discussed in next post. Next important factor is concrete cover; according to Broms (J. ACI, Vol. 62 no. 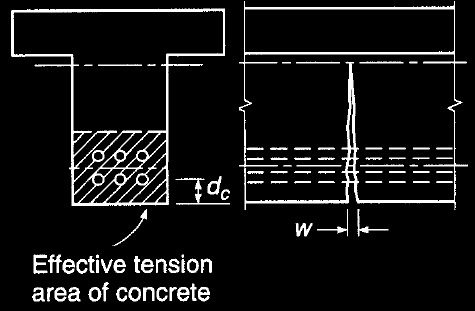 10, 1965) crack width and its spacing depends on concrete core distance, dc which was also established by different researchers. dc is measured from center of reinforcing bar to face of concrete section. It is found that generally when cover is increased, crack width is also increased and as usual cracks spacing is increased. Distribution of reinforcement in tension zone in tension member is important too.In general, instead of using less number of larger bars to meet steel requirement (As), more number of smaller diameter, will show better control on crack. A well distributed tension bars over tensile zone of concrete, efficiently limit crack on tension member.In deep members, generally there have web and flanges. In such flexure members, addition of reinforcement on sides of web is required to resist propagation of excessive cracks and to arrest width of cracks on surface above level of main reinforcement on tension zone offers better control. Cracking in concrete is a quite random process and depends on many variables. Considering complexity, width is determined based on test observations. Thank you for this list..EXPANDO is an expansive mortar chemical that cracks rocks and concrete. It is a concrete cutting, granite breaking and general demolition solution.